These apartments are centrally situated in Cavtat, just 100 metres from the Old City neighborhood and 300 metres from the beach promenade. All Apartments Vesna are air-cooled and come with a seating area, TV and a well-equipped kitchen. The apartments offer a balcony or outdoors terrace with views of the sea or town centre. Apartments Vesna provide free car parking, and are just 100 metres from the Bukovac House and Gallery. Air-conditioned accommodation, max 4 persons ~0,1 km, Cavtat Book this remodelled and just recently furnished family apartment in the known tourist resort of Cavtat for complete relaxation and satisfaction throughout your summer vacations on Croatian coast. Distance to the bar: 1km. Distance to the ferryboat: 1km. Distance to the beach: 1km. Distance to the restaurant: 1km. Entertainment and Outdoor activities: TV, Satellite television, radio. Mlini ( ~ 4.8 km ): 212+ apartments, 35+ villas, 3+ hotels. Srebreno ( ~ 5.1 km ): 163+ apartments, 9+ villas, 8+ hotels. Cilipi ( ~ 6.4 km ): 16+ accommodation units. Drvenik ( ~ 7.4 km ): 1+ villas/holiday houses. Dubrovnik ( ~ 13 km ): 1597+ accommodation units. Lapad ( ~ 14.4 km ): 656+ apartments. Beach Hotel Croatia ~ 0,5 km from Apartments Vesna Rocky beach: ideal for families, with restaurant, with caffe bar, equipped with showers. Excellent choice of watersports. Nudism is allowed. Beach Fkk Plat ~ 3 km from Apartments Vesna Gravel beach: ideal for families, with restaurant, equipped with showers. Nudism is allowed. Beach Fkk Mlini ~ 4,6 km from Apartments Vesna Sandy beach: ideal for families, with restaurant, equipped with showers. Nudism is allowed. Beach Lokrum, Dubrovnik ~ 9,5 km from Apartments Vesna Gravel beach: ideal for families, recommended for young people. Excellent choice of watersports. Nudism is allowed. Beach Sv. 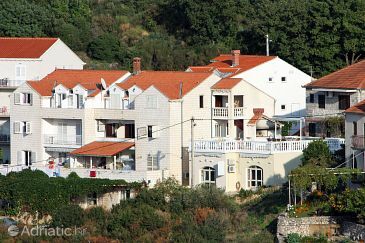 Jakov, Dubrovnik ~ 10,3 km from Apartments Vesna Gravel beach: recommended for young people, with restaurant, with caffe bar, equipped with showers. Excellent choice of watersports.